V.T. Augmentation II; V.T. Augmentaion III; Citaric Melodies III (2016/18); Prisma Interius VI (for v.t.) (2017). 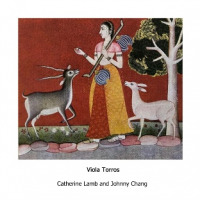 Johnny Chang: viola (1-2, 4) arrangement (1-2); Catherine Lamb: viola (1-2, 4) arrangement (1-2); Bryan Eubanks: resonances (1-2); Antoine Beuger: voice (1); Yannick Guedon: voice (1); Deborah Walker: voice (1); Rebecca Lane: voice (2); Annie Garlid: voice (2); Margareth Kammerer: voice (2); Suidobashi Chamber Ensemble:- Wakana Ikeda: flute; Yoko Ikeda: violin; Masahiko Okura: clarinet; Taku Sugimoto: electric guitar; Aya Tanaka: bassoon; Johnny Chang: viola; Samuel Dunscombe: bass clarinet; Michiko Ogawa: clarinet - (3); Andrea Neumann: secondary rainbow synthesiser (4); Derek Shirley: cello (4).